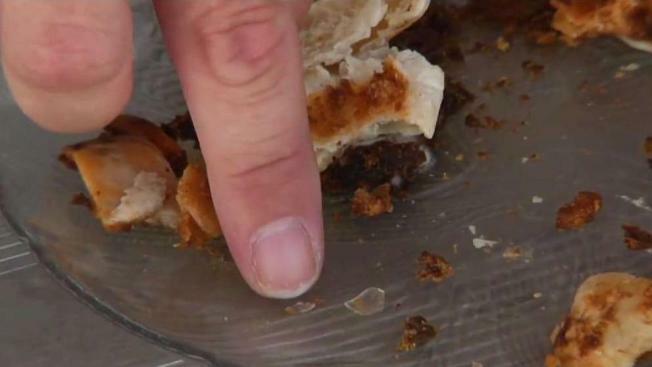 A Santee, California, mother is warning people about a potential hazard after finding glass shards in her daughter's frozen burrito. Tracey Brintle's daughter, Kayla, was eating a Tina's Beef and Bean Burrito that she bought from a local 99ȼ Only Stores about two weeks ago when she suddenly heard a crunching noise. "It's a beef and bean burrito so you shouldn't be hearing anything," Brintle said. "And I saw what's left on her plate and I saw that there was glass." Brintle immediately rushed her daughter to the emergency room, but her daughter was OK. Brintle reached out to both 99ȼ Only Stores in Santee, where she bought the burritos, as well as the maker of the burritos. A representative from Tina's Burritos had told Brintle the company would send her a box to ship the burrito back to the company so it could test the food. The company has not sent the box since that conversation, though the company did call her again Friday to say a box was on its way. Brintle said she wants to warn parents about the potential hazard because she doesn't want what happened to her daughter to happen to another child. She said she doesn't want to wait for the company to complete its testing before deciding to pull the batch from shelves. "I'm sure that batch is still available in stores because I only bought it in the middle of August," Brintle said. "And it needs to be pulled off the shelves." A spokesperson for Tina's said Brintle's incident was their only known complaint. "The matter has been escalated to the highest levels of our company. We are currently engaged in the process of a full and detailed investigation which we conduct in the case of receiving feedback of this nature," Customer Service Manager Lee Ann Vasquez said. The company's testing process includes both the burrito in question, once retrieved from the consumer, and other burritos in the same production run, Vasquez said. So far, their testing has not found any other problems. In addition to 99ȼ Only Stores, Tina's Burritos is also available at other grocery store chains, such as Smart & Finals, Food 4 Less and Vons. The 99ȼ Only Stores in Santee said it's started the recall process but the company. Tina's has not recalled any burritos.